Thank you Afif for sharing..If I may build on your precious ideas, I would say that first the NGO should set/review/redefine or build on(depending on where deos it stand) their vision/mission/SGs as they constitute the lighthouse on any human capital management strategy the NGO would like to adopt. On another level, and as you have mentionned, through defining the tasks and the JD of the staff/JD,it would be good if the NGO agrees on a set of KPIs with the concerned person (before the induction phase) in order to define clear, transparent, and participative basis for cooperation. And the hole process/methodology would surely increase the productivity and consolidate retention, especially if a “care for care givers” program is integrated in order to avoid burnout – a widespread phenomenon nowadays in NGOs. thanks Afif, and keep up the good work! 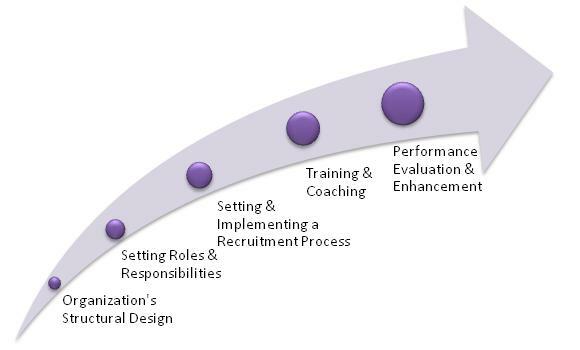 Looking at your chart on “Human Capital Management in NGOs” I cannot fail to notice the absence of one critical first step in the NGOs structure that should, in my opinion, precede all the others. I mean by that, a clear definition of the NGO’s Mission and its objectives. Unless the NGO’s MISSION and the means to achieve it are, from the start, clearly defined and understood by every single member, I fear that the NGO will keep floundering. In 2006 I became member of an NGO whose basic Mission was to combat corruption in my country on a national level. Sad to say it, during the past seven years the following results occurred: (1) the national rate of corruption has spectacularly increased instead of diminishing. (2)Within a period of seven years the executive directors were replaced four times without bringing about any substantial improvement in the performance of the NGO. (3) The NGO’s goals and objectives were never clearly defined, nor was the NGO’s performance regularly monitored by the members and/or by the Board of directors. In my opinion, the one million US dollars annual budget of that NGO has been wasted, at a time when Civil Society badly needs such an amount in order to combat corruption and allow it to contribute in drawing up a national social and economic development Plan for the country. 2. It did not subsequently clearly identify its goals and its objectives, as well as the program set to achieve them. 3. The Board did not regularly monitor the NGO’s overall performance and its detailed aspects, nor did it require monthly achievement reports from all the members involved. 4. But, the most serious mistake, in my opinion, remains the total dependency of the NGO’s Management to the whims and the demands of the local corrupt Public Authorities. That total absence of independence prevented the NGO’s Management team from demanding more transparency in public governance and requesting the government employees to help them in their fight against corruption.